A supercat is a camp stove made out of a cat food can. It's super because it's light-weight, dependable, and it's free. I've been using supercats for several years now in everything from motorcycle-camping to fastpacking, and it still finds its way onto my pack list. You can make one yourself with nothing more than a cat food can and a plain, office hole puncher. Find a cat food can. If you don't live with a cat and are not friends with a cat, I suggest befriending a cat, a cute cuddly one, as your life will be enriched in many ways, the least of which will be a continuous supply of free camp stoves. Sans cat, there's always the option of buying some cat food and tossing the contents, or buying some potted meat, which looks similar to cat food, but is intended for humans. Anyway, get yourself a can, emptied and cleaned. It should be 3 oz in volume and constructed of aluminum (these are important). It's difficult to tell which cans are aluminum and which are steel. Steel will feel heavier than aluminum and will not work with a hole puncher. But the easiest method is to find a brand that uses aluminum and stick with them. Fancy Feast cat food uses aluminum. Take the hole puncher and punch a row of holes all the way around below the rim. These are your jets. You want the jets to be close to the rim since their height will limit how much fuel you can pour in, but not so high that the sturdiness of the can is compromised. It's fun to get a couple cans and experiment. The standard supercat fuel is denatured alcohol (an ethanol and methanol blend), commonly sold in hardware stores in the paint section because it works well as a paint thinner. Denatured alcohol can also be found in marine supply stores because many boats still use alcohol stoves, and sometimes in backpacking stores (although over 150% the cost at hardware stores). Rubbing alcohol (isopropyl alcohol) will also work fine in a pinch, but is more expensive than denatured alcohol. Liquor (ethanol and water) will burn, but the water content is too high to practically cook with. With the stove on a flat, cleared surface, fill it with fuel to just below the jets. Light a butane lighter and stick the flame into the stove through one of the jets. The fuel vapors will ignite, and a blue flame will burn above the stove. The flame will be nearly invisible in daylight, so search for the flame with caution. Before setting a mug/pot on top, the fuel needs to be boiling to create enough pressure to push the vapor out the jets, i.e. the stove needs to be primed. Hold your mug/pot about a centimeter above the stove to speed this up. Ethanol has a low low specific heat so this shouldn't take more than a minute. 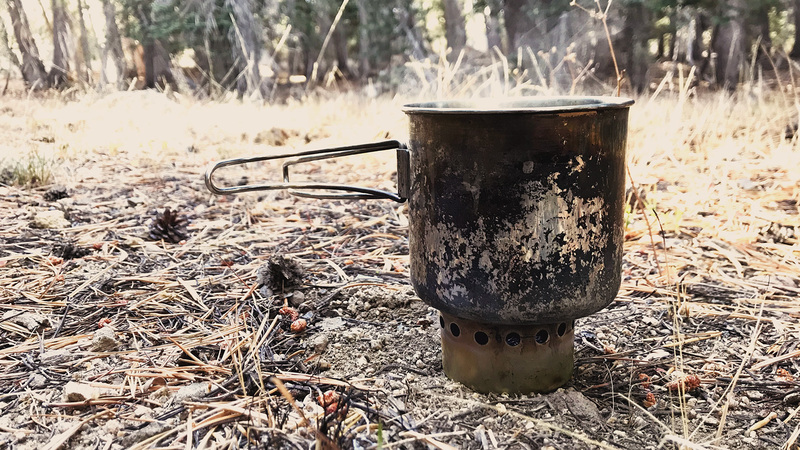 Once you see/hear the fuel boiling, set your mug/pot on top of the stove. The flame should be coming out the jets and the fuel should remain boiling for the remainder of the burn. With one row of jets, the stove will burn for about 15 minutes on one fill, just enough to cook rice or pasta in 500 mL of water. If you built your stove with two rows of jets, water will boil faster but burn time will be reduced to under 10 minutes. Weight. It's light. At under 0.25 oz, you'll be hard pressed to find something lighter. The supercat's also small enough to fit in a camp mug. Ease of transport. Because the fuel isn't pressurized, it can be carried in a small water bladder instead of a bulky fuel canister that's just as bulky empty as it is full. Fuel availability. Denatured alcohol is a staple in every hardware store so is more widely available than other camp fuels, something to consider if through-hiking and/or traveling in another country. Rubbing alcohol is also easy to find. Safety. Alcohol is water-soluble. This means that if, for whatever reason, you lose control of your fire, dousing it with water is always an option. Dumping water on other types of fire may simply cause the fire to spread. The simple design is very susceptible to wind, to the point where it won't stay lit without a windscreen on windy days. Alcohol has a high boiling point (78°C) compared to other stove fuels, so that in the winter, vapors are almost non-existent. It's very difficult to light with a fire steel in cold weather. Winter use requires preheating the fuel with body heat, and/or using a match or butane lighter to heat the surface of the fuel when lighting. Alcohol has a lower energy density compared to other stove fuels, so it will take longer to cook with. In daylight, an ethanol flame is barely visible, which requires caution. For tax purposes, denatured alcohol contains methanol to make sure you don't drink it. Methanol is quite toxic and will quickly lead to blindness and death if ingested. You can also be exposed to methanol by breathing the fumes and by contact with the skin, so extra caution is required when handling the fuel. Cat food aluminum isn't designed to withstand a flame and will become brittle after tens of uses. At some point, it will collapse under the weight of a full cook pot, but I retire my supercats before this happens since replacements are free.